1) Find your call sheet in the schedule and click on the "Edit" button. 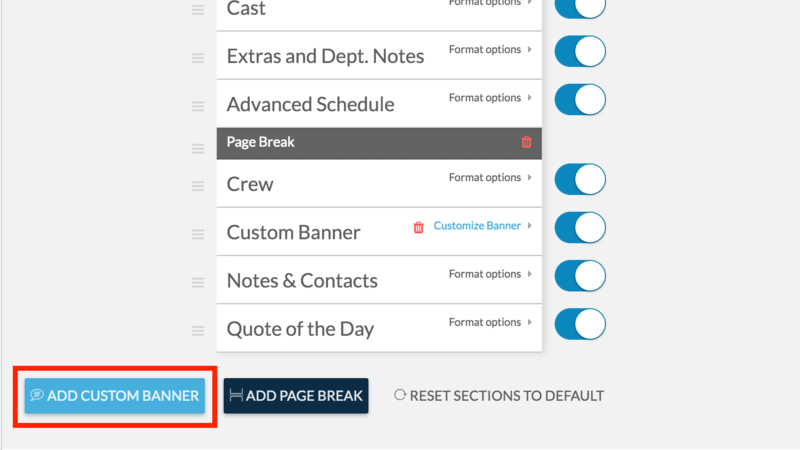 2) In the call sheet editor, visit the "Page Settings" tab. 3) Here you will see a list of the sections on your call sheet. You can hide or show sections and drag them around into the order you prefer. To add a new custom section, click on the button that says "Add Custom Banner". 4) A new banner will be added to the top of your call sheet -- feel free to drag it into a new position. Click on the blue "Customize Banner" text to twirl down a text box. Here you can edit the content of your banner. The text box can contain plain text or html content. HTML allows you to make text bold or italic, or adjust font size or line spacing. Here's a tool to allow you to easily create HTML code. You can also choose a color, style, and icon for your banner.